Creating a Yard Worth Screaming About - Executive Landscaping, Inc.
It’s almost Halloween! So it’s also time to trick out your yard and get it looking like a treat, rather than a horror. Sure, you might want to make it look scary – but the scary factor should come from your ghoulish decorations, not the actual state of your yard. That said, there are a few things you might want to put on your to-do list along with stockpiling the candy supply and picking out costumes before the store shelves are barer than a fruit tree in winter. If you’re a seasonal decorator, it’s time to stow away any outdoor décor that seems summery. Clean the porch with a pressure washer or a good sweep and spray to rid everything of any accumulations of summer pollen and mildew. Tackle the fallen leaves that have likely scattered the yard. Instead of tossing them, however, use those leaves to your advantage by incorporating them into your Halloween and harvest-themed design. Pack them into fun jack-o-lantern printed trash bags or make a wreath with them for your front door. Shop for organic elements like pumpkins and moss, which can be used to spook-ify the lawn naturally. Use sheets and gauzy white fabric materials to create ghosts and goblins and hang them under porch eaves to catch the breeze and spook your guests, and stake a few creepy signs or headstones throughout the front lawn to turn your grass into a graveyard. Using your existing outdoor elements can keep your decorating budget below horrifying levels without being any less scream-worthy, so be creative. Gather fallen tree branches and arrange them into pots, then drape them in cobwebby materials to make them look cool and creepy. Snoop around the garage to add to the scare and use things like rakes, shovels, and wheelbarrows as tools of terror, setting the scene with skeletons toiling away at their deathly duties. No Halloween would be complete without witches, so collect more tree branches to make a broom worthy of the most wicked of these spell-speaking cackle queens. Drape your trees and bushes with more cobwebs, and string them with lights that cast a black or orange glow to make them a fun feature in your scare-scape. Any outdoor space can be a great place to let your creativity run wild, so be imaginative and think outside the box. Your yard is your playground, so trick it out and your trick-or-treaters will be in for a real treat. Scare up some fun in your yard! 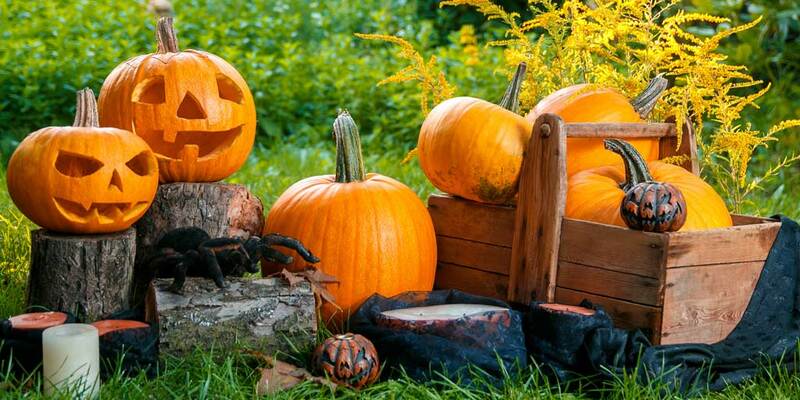 Give the team of outdoor experts at Executive Landscaping, Inc., a call today to schedule a consultation and find out more how we can help you get your lawn and garden healthy and Halloween ready!